It is natural that Every action has a reaction and in the context of this post it was getting out of control. Once upon a time, having a mobile phone was torment with the messages from short codes of advertisers. 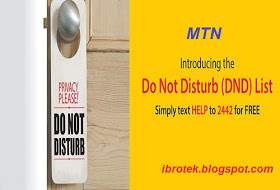 Following complaints, MTN Nigeria in line with NCC directive implemented Do Not Disturb (DND) policy. It brought with the benefit of calmness but unknown to many it has the effect of stopping bulk SMS and other third party SMS from reaching MTN subscribers. To receive bulk sms after reading this post, send ALLOW to 2442 to disable the DND service. Text STATUS to 2242 to confirm your status on the DND policy if you are active or not. First text "STOP" to 2442. Then text "ALLOW" to 2442 to deactivate the DND policy to enable you receive SMS. After the above is done, you will then receive a confirmation SMS that you have been "successfully deactivated" from the policy. You can read more about this directly from MTN Nigeria here .